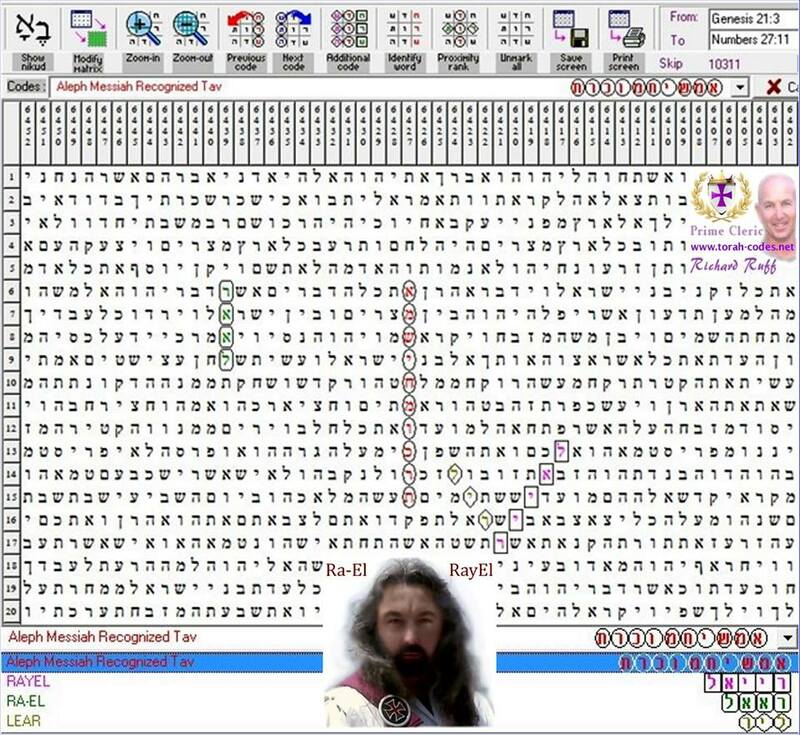 Lord RayEL Exposed – TORAH CODES are Fudged. 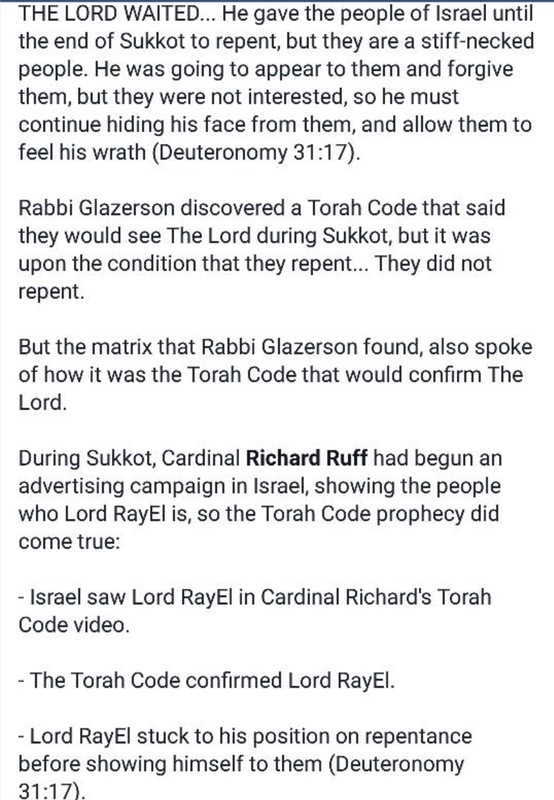 Rabbi Glazerson confirms that RAYMOND LEAR is not the returned Moshiach and that he CHEATS with the BIBLE CODES. If you are unfamiliar with the Torah Code—aka: Bible Code. It is a code found in the first five books of the Hebrew Bible. This code can be found by skipping equal numbers of letters through the original Hebrew text. This phenomenon is called ELS—Equidistant Letter Sequencing. Simply put scholars are finding messages in the Torah by skipping the same amount of spaces, and finding words in an acrostic puzzle like manner. Basically algorithms. 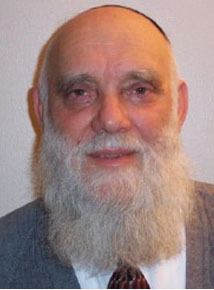 Top Torah Code Researcher Matityahu Glazerson has a very extensive credentials including authoring more than 30 books in Hebrew, which have since been translated he is also somewhat of a Gemantra Whizz. Glazerson is not a Christian, he is a Jewish Rabbi who believes that one day the Mashiach (or Jewish messiah) will return. (Before its news) RAYMOND LEAR (Lord RayEL) believes that he is, the MASHIACH. The difference is that the Christians see this, soon to return Jewish Mashiach, as the Anti-Christ. Since Jews do not believe Jesus is God, they believe this Mashiach is the official “messiah”. Now, this is where it gets rather interesting. Rabbi Glazerson previously stated that RAYMOND LEAR was not the returned Moshiach and that he CHEATS with the BIBLE CODES. The Ecumencal Order of Christ will not show you this. The Ecumenical Order of Christ (Raymond Lear’s following) told their Facebook following in the Congregation of Lord RayEL several times that they were in diplomatic negotiations with Rabbis regarding this announcement. Lets just take a look at the revealing Torah Codes. 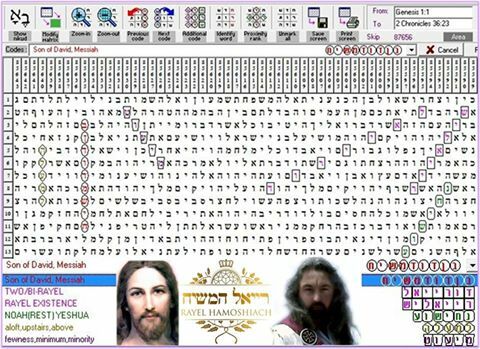 MESSIAH SEEN – 1 of 2 Torah Codes. Rather bizarre code here, which mentions False Prophet Richard Ruff. Back-peddling statement (one of those just-in-case-moments). 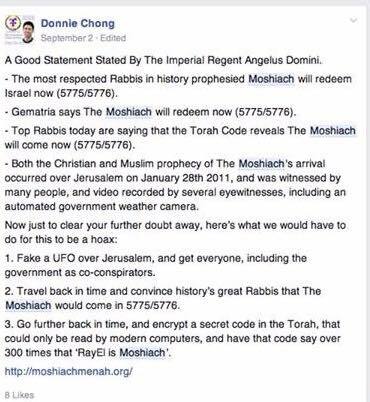 This totally contradicts the Torah Codes produced by Richard Ruff stating that LEAR would be recognised as the Moshiach in the year 5775 (See above codes). FACT … The Rabbis will not recognise a False Prophet. Don’t you just love these Christ wannabes, always fashion themselves of a Pre-conecption. Ask them why, and they will always play the Shroud Of Turin Card. 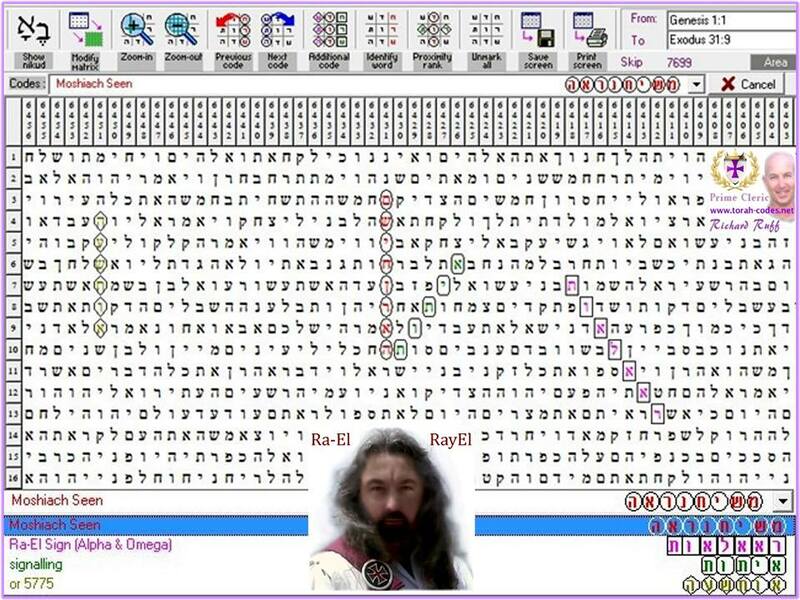 An article in the Jews News states that The Jewish Torah code expert Glazerson now points to the Moshiach being revealed in the year 5776 and on Sukkot 5776. Following which Richard Ruff fudged the above Torah Code. QUOTING CHABAD: “The term Mashiach unqualified always refers to Mashiach ben David (Mashiach the descendant of David) of the tribe of Judah. Apparently, the (final) redeemer who shall rule in the Messianic age. So why the bloody hell – hasn’t Raymond Lear said this beforehand …. AGAIN., Torah codes are being fudged to fit the occasion. Fact —- both Glazersons and Ruffs prophecies for the 5775 failed. This is typical back-peddling by The Ecumenical Order. According to the Jewish bible the task of the Mashiach (or messiah in English) is to save the Jewish people from its enemies and rebuild the nation of Israel. It is also interesting to note.. The Jews did not believe in Moses, because of the miracles he performed. Whenever anyone’s belief is based on seeing miracles, he has lingering doubts, because it is possible the miracles were performed through magic or sorcery. All of the miracles performed by Moses in the desert were because they were necessary, and not as proof of his prophecy. 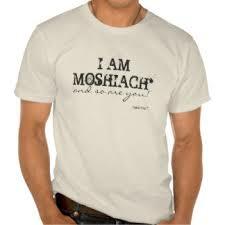 The Jewish people have awaited the arrival of Mashiach since the beginning. There have been many that have professed to be the promised Mashiach such as Jesus and Shabbetai Zvi, Bar Cochba and among others have been rejected. 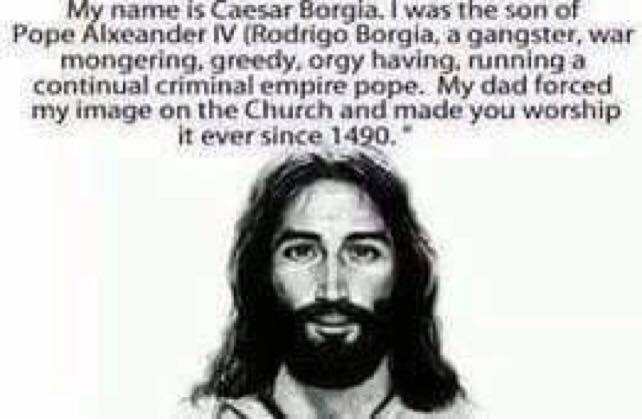 The bible never mentions about believing in the messiah. He must be a member of the tribe of Judah- Gen 49:10 “The staff shall not depart from Judah, nor the scepter from between his feet”. To be a member of any tribe, the person must have a biological father who is a member of that tribe including the tribe of Judah. The World’s Best and Scientific Site on Bible Codes, accessed online. That’s if they are correct Terry. Richard Ruff manipulates the Torah Codes to suit his purpose. Make no mistake about that. This is absolutely true. Rabbi Glazerson’s good name is being disrespected every time they mention it. 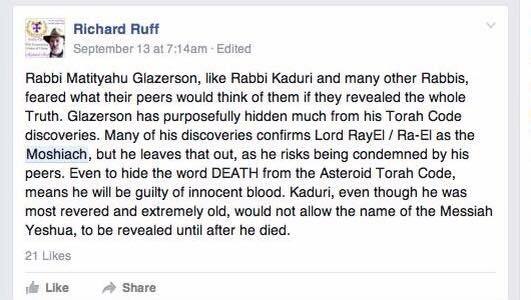 Rabbi Glazerson will not confirm ra-El as Moschiach’s as he knows that they are lies. 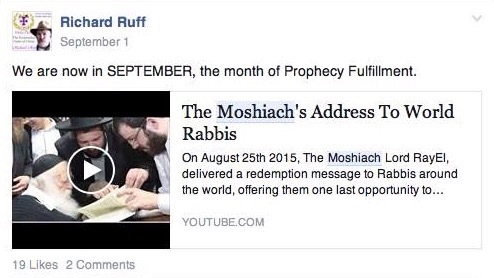 He has stated – that the Torah Codes produced by Ruff are FAKE. 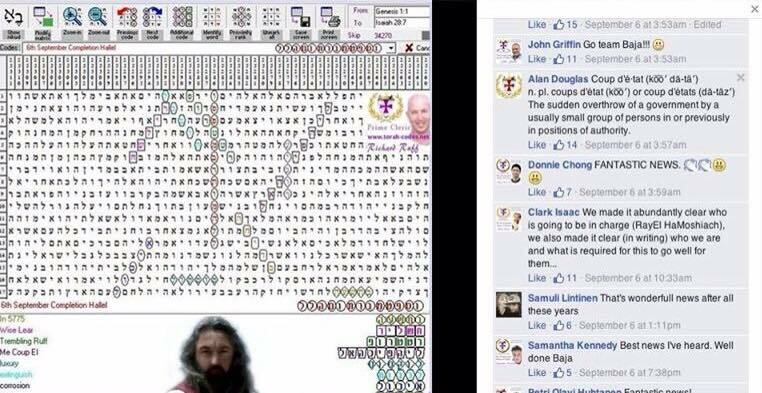 The Torah Codes are a tool that when used by Richard Ruff aka Moses is used to deceive you into believing that Raymond Lear is the returned Christ. This is a lie that is compounded and backed up by more lies. saludos y gracias. Yo estaría más que feliz de ayudar. si desea enviar la fotografía a mí y mayor cantidad de información sobre el mismo, que sería grande. lordrayelexposed@gmail.com. greetings and thank you. I would be more than happy to help. if you would like to send the photograph to me and as much information on it, that would be great. lordrayelexposed@gmail.com. Who is Lord RayEL Ra-el? Yohanan on Who is Lord RayEL Ra-el? Richard Ruff attacks Richard Shaw and SkywatchTV.